So, I’m back in the chemo chair getting my second round of chemo. I’m already up to the Carboplatin, with only the Herceptin left. Time flies as the drugs drip in! The room is set up as a horseshoe – this is the curved end. There’s around 18 seats in the chemo room at the Regional Cancer Center’s chemo room, and most of them were full this morning. I’ve had my neighbors come and go at least once since my chemo takes six hours today. It’s an hour shorter than the first time since my Herceptin dose isn’t as big, but still longer than most of the other chemo patients in the room. 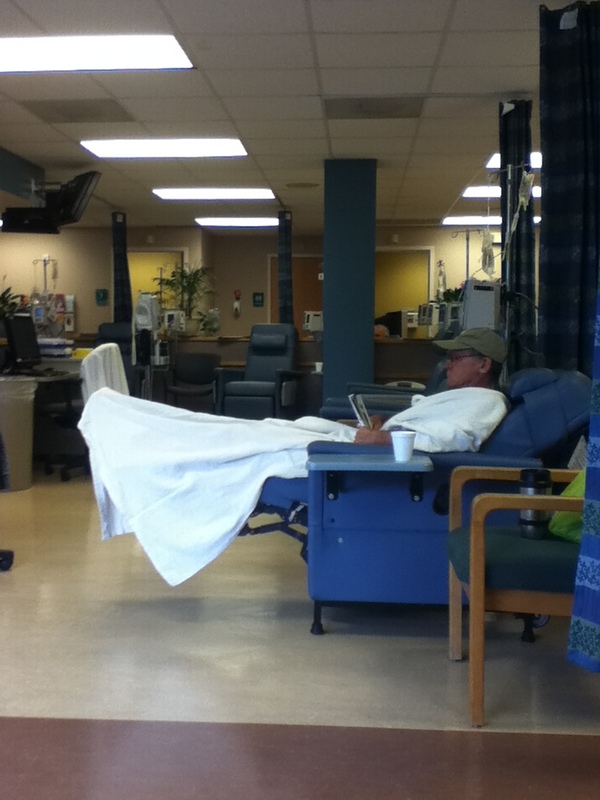 Before I got chemo, the doctor went over my bloodwork to make sure I was healthy enough to get the chemo. The bloodwork was mostly good. My hemocrit and hemoglobin levels were a bit low, so the doctor’s going to check my iron levels. I’ll be upping the fresh greens in my diet as well in the hopes of increasing iron without having to resort to medicine. I also had some high liver function levels, so we’ll have to monitor that since one of the side effects of the chemo is to mess with the liver. I still got the full dose today, but we’ll see what happens in the future. Mom came to visit with me. I don’t have near as much hair this time, but there’s still some under that hat. 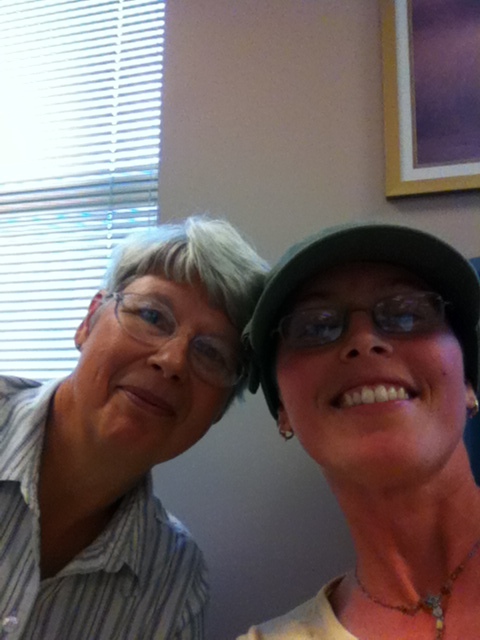 My mom came with me to chemo today, so we’ve had a nice chat on and off throughout the day. It does make the time go faster when I have someone to talk to. She also helps with things like unplugging my stand when I need to use the restroom (and with all the fluids they’re pumping in, the restroom calls often in the afternoon) or fixing the pillow on my chair. I didn’t notice any of the drugs going in this time, not even the Benedryl. I also managed to sleep normally last night, even with the steroids in my system. Coming in rested makes the day go much smoother. This entry was posted on August 14, 2013, in Uncategorized. Bookmark the permalink.